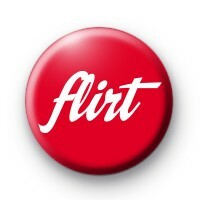 This bright red button badge has the word Flirt in pretty white lettering. Are you a little cheeky and have a flirtatious side or do you know someone that this badge would be perfect for. We think this would be a fab badge for sassy hen parties or even Valentines Day as a handmade favour or cheeky token of flirtatious fun. We have quite a few adult, cheeky slogan badges in the shop so take a browse through those too before you checkout.